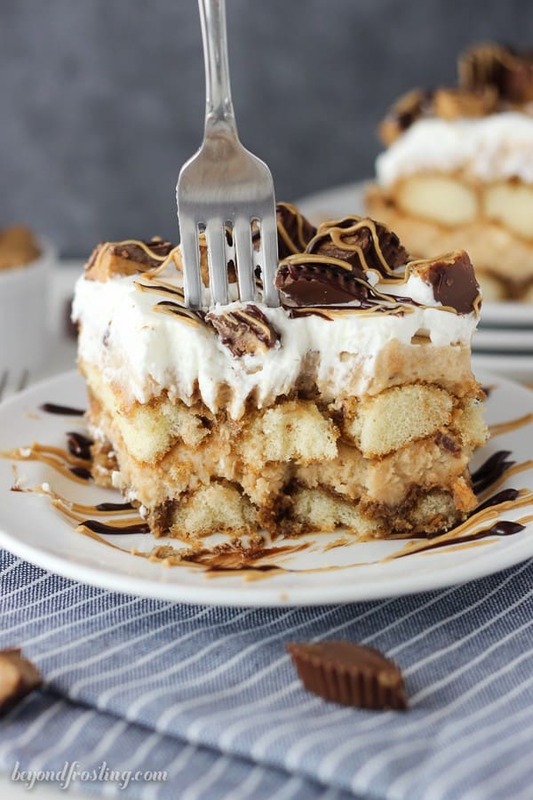 You’ll need an extra big fork for this Peanut Butter Cup Tiramisu. 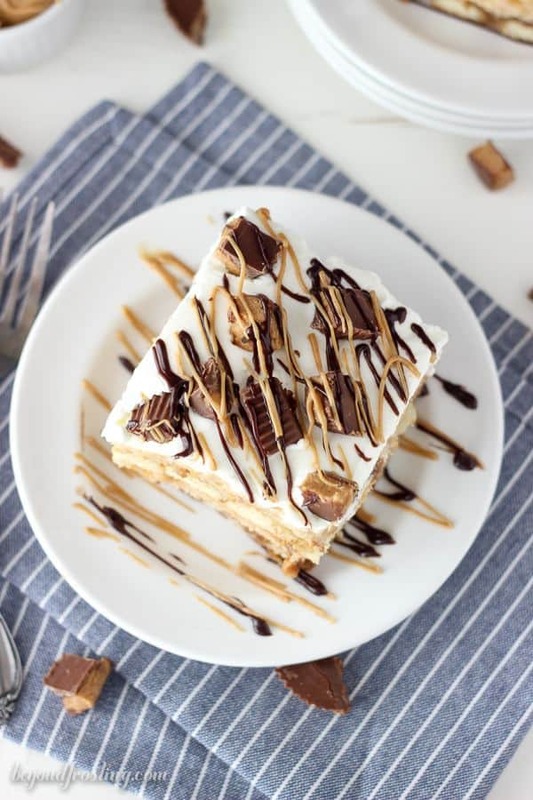 This dessert is layers of espresso-soaked ladyfingers, peanut butter mousse and whipped cream. 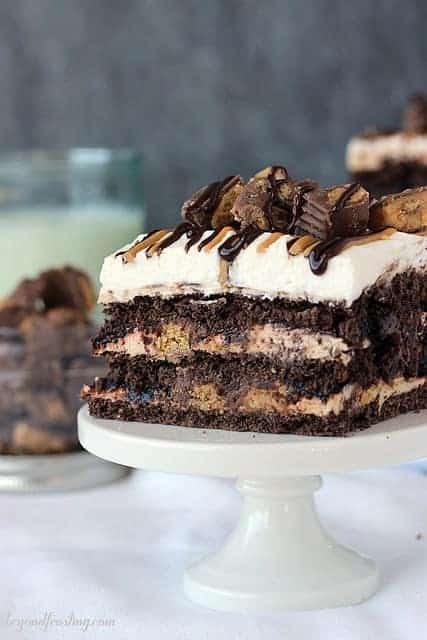 It’s also loaded with Reese’s Peanut Butter Cups, that’s just a bonus. In a week and half I am jetting off to Myrtle Beach for a short vacation. The last time I went to Myrtle Beach was when I was twelve. We drove from Vermont to South Carolina and stayed in a hotel right on the beach. I remember bits and pieces of our trip, but I am really excited to go back, see some friends and hang out at the beach for a couple days. Do you guys have any favorite spots? Please let me know as I am not familiar with the area at all. After a travel hiatus, I am ready to get back at it! March is going to be a busy month and I couldn’t be more excited. See ya later February. Before we say goodbye to February, I must share this dessert with you. No-bake desserts are kind of my thing. It’s one reason I wrote a cookbook about them. I enjoy sharing no-bake desserts with you because I know that you’ll be successful with them too. I want you to have fun in the kitchen and to enjoy creating the desserts as much as I do. So I spend time racking my brain to think of what types of over the top, mouth-watering treats I can come up with next. Apparently you guys love them to, because you keep coming back for more! 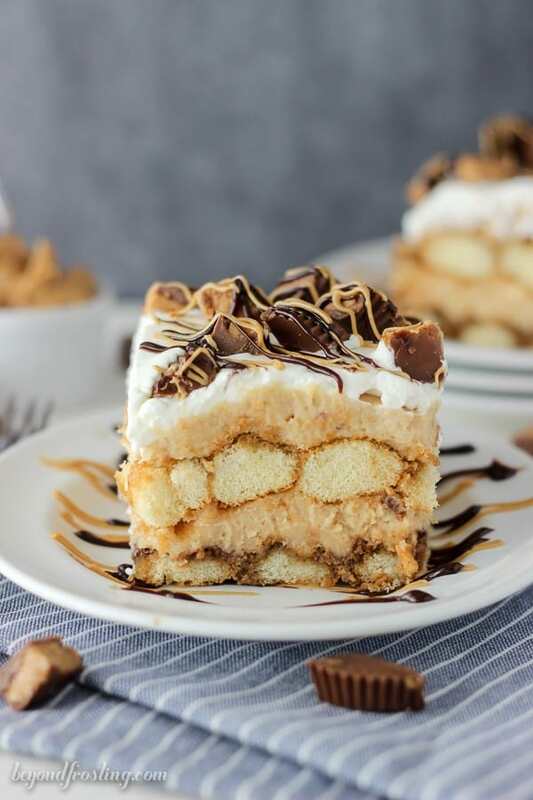 Today we’re going a little crazy with this Peanut Butter Cup Tiramisu. 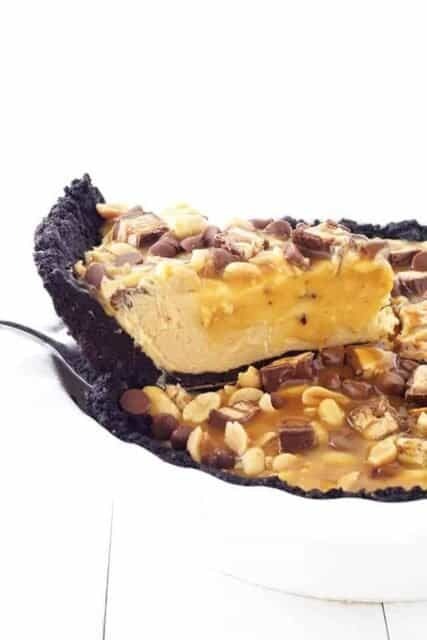 This is a peanut-butter lovers dream come true. 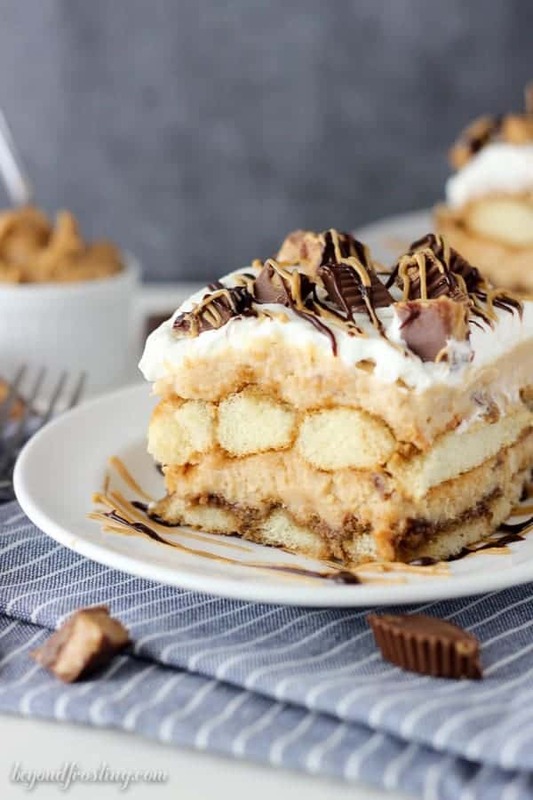 It’s layers of espresso-soaked ladyfingers, a peanut butter mousse stuffed with peanut butter cups, a layer of whipped cream and some more peanut butter cups on top. Just try and get all of that onto your fork at once. I dare you! This dessert is a mash up of my Peanut Butter Cup Lasagna mixed with elements of a Tiramisu. I don’t know if you remember a few months back when I was tiramisu-obsessed, but I’ll tell you it hasn’t gone away. You can do this with coffee or even with milk if that’s more fitting. I guess true tiramisu lovers would disagree that this is actually a tiramisu (on account of the missing eggs), but that’s okay. We don’t need that type of negativity around here. Just kidding, I still love you. The one thing I have learned through all the Tiramisu I have made is that it is best to really coat the lady fingers in liquid so they are nice and soft to cut into. Before you start dipping your lady fingers, just be sure that all your other components are prepared so that you can work quickly and get it all in the refrigerator to set. I swear the hardest part is waiting for this dessert to set up. And of course, trying not eating the whole thing in one sitting. In a microwave-safe glass, heat the water until bubbling: 60 to 90 seconds. Add the espresso powder and mix until the espresso powder is dissolved. In a bowl, combine the brewed espresso with 2 tablespoons Kahlua. Let the mixture cool while you are preparing the mousse. In a large mixing bowl, beat the mascarpone cheese at low speed for 30 seconds with the whisk attachment to eliminate any lumps. Increase the speed to medium and slowly start adding heavy whipping cream, about ½ cup at a time. The idea is to slowly add the cream so that the mascarpone cheese will not be lumpy; it should resemble a liquid consistency. Increase speed to medium-high, and as the mixture starts to thicken, slowly add the powdered sugar. Increase the mixing speed to high and beat until soft peaks form. Lastly, add the peanut butter and beat at a high speed until stiffer peaks form and the peanut butter is well incorporated. Unwrap and chop the peanut butter cups into 9 small pieces and fold into the peanut butter filling. Set the filling aside. For the layers: To assemble the dessert, line the bottom of a 9-inch square dish with parchment paper. 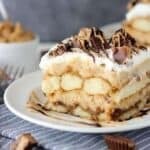 Dip the top and bottom of each ladyfinger in the espresso mixture and line the bottom of the dish with one layer of dipped ladyfingers. You may need to cut the ladyfingers in order to fit two rows into the dish. Heat the hot fudge sauce in the microwave for 30 seconds. Drizzle half the hot fudge sauce over the ladyfingers. Once the bottom layer is built, spread half the peanut butter mousse over top. Add the next layer of dipped ladyfingers, remaining hot fudge sauce and followed by the remaining mousse. For the topping: Place your mixing bowl in the freezer for 5 to 10 minutes to chill. Pour the heavy whipping cream into the chilled bowl and use an electric mixer to beat the heavy cream on medium-high speed until it’s bubbly. Slowly add the powdered sugar and continue beating on high speed until stiff peaks form. Spread the whipped cream over the top layer of the mousse. Unwrap and chop the remaining peanut butter cups and sprinkle over the top of the whipped cream. 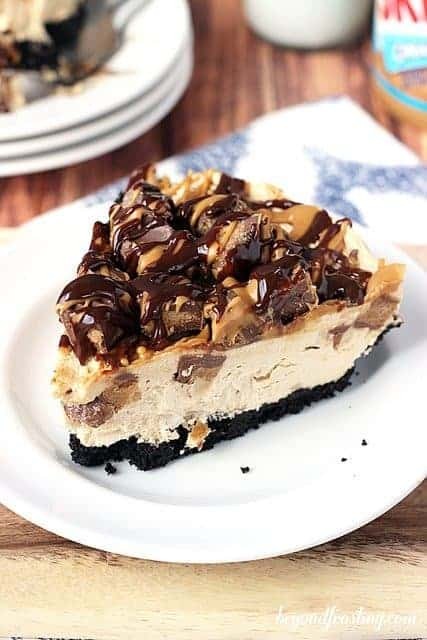 To drizzle the hot fudge and peanut butter over the top, each one individually for 15 seconds and then drizzle with a spoon or piping bag over the top. Refrigerate the tiramisu for 4-6 hours until the mousse is more firm. Keep stored in an airtight container for 2 to 3 days. If you can’t find espresso powder, substitute with strong-brewed coffee. “cook time” is also refrigeration time. That’s awesome Joanne!! Please let me know what you think! This looks so delicious, and I have all the ingredients to make it. Thank you for another no bake dessert!